When Atlas first launched last month, it didn’t cannonball into the high seas so much as belly flop. The resulting wet slapping sound continues to echo around in the game’s Steam review section to this day. Even though the game is still eliciting cringes and jeers from its reviewers, Atlas has somehow also become hugely popular. 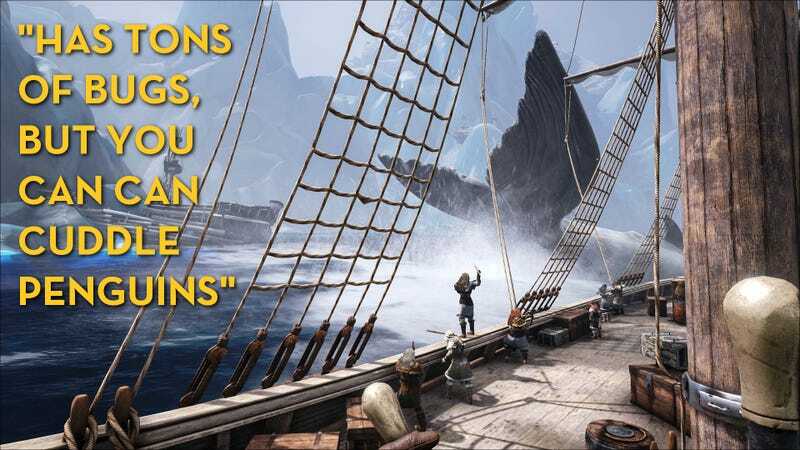 Despite the fact that only 32 percent of its reviews are positive, the pirate-themed survival MMO from the creators of Ark: Survival Evolved has remained a Steam top-seller since day one, and it pulls decently sized crowds on Twitch, too. The game’s launch—even after a much-publicized countdown that ultimately led not to a release, but a last-second delay—showed that Atlas wasn’t yet able to live up to its lofty ambitions. Straight out the gate, the game prevented players from logging in entirely. Once people were able to play, a minority of players managed to claim important coastal areas using the game’s land claim system. Those early land-grabs made it frustratingly difficult for other players to gain a foothold. And all the while, everyone had to endure a tedious grind in hopes of unlocking boats and other implements of pirate-flavored mischief-making. There were also bugs and optimization issues reminiscent of Ark, the previous game this studio had made. In recent days, those choppy waters and dark clouds have given way to a few thin rays of sun. Developer Grapeshot Games has released patch after patch with the aim of squashing bugs and filing some edges off the game’s grindier aspects. Steam reviewers seem to appreciate the effort, and the game’s potential has begun to shine through.